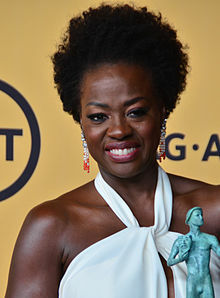 Viola Davis (born August 11, 1965) is an American actress and producer. She is the first black actor to have won an Academy Award, an Emmy Award, and a Tony Award in acting, named the Triple Crown of Acting. ^ "Viola Davis Gave The Most Powerful Speech At The Women's March On Intersectional Feminism". Retrieved February 24, 2018. ^ "Viola Davis". Golden Globes. Retrieved March 16, 2018. ^ "Viola Davis". BAFTA Awards database. Retrieved March 16, 2018. ^ "Viola Davis - Box Office". The Numbers. Retrieved May 26, 2018. ^ "Viola Davis". www.rottentomatoes.com. Retrieved May 26, 2018.